In a strength finder survey conducted by Gallup, that summarised my personality and generated my top strengths, Positivity ranks fifth. While, the Gallup strength finder elaborates on the advantages of this attitude, it also warns us on the downsides of overusing it. That means, at times, our greatest strength could turn into a weakness. On the 26th of January 2018, I could relate to this paradox. As they say that truth is stranger than fiction, I have often found that by being truthful to myself and narrating an event exactly how it happened, makes a much better read than fictionalising it. Hence, I would like to inform my readers that what follows, tries to capture the events precisely as it occurred on that day, with no conscious effort to glorify or exaggerate an episode or thought beyond its deserved merit. If done so, it only tries to explore the emotional state I was in, at that particular moment. Because, such an analysis is possible only after the event has occurred and that emotion or the state of mind which existed during the incident can never be exactly reproduced. I would also like to state that this article definitely does not seek any sympathy towards us as that in itself would defeat the purpose of this writing. Furthermore, it does not intend to instigate any kind of fear in those who love what they do. On the contrary, it tries to bring awareness towards a possible occurrence and wishes to share a few learnings. However, the main motive of this narration remains in deconstructing the event to evaluate the details and allow self-reflection respond to the dilemma of dealing with our hidden emotions. Hence, It is written first for myself and then for the others. It was already 3:30PM when we reached Ratnagiri, a small village located in Rolla Mandal of Anantapura district in Andhra Pradesh. It is about 21 kms from Madhugiri, on the Andhra Pradesh and Karnataka Border. For the movie that I create after every trek, we recorded an Introductory clip on my iPhone 7. My friends, Parth and Manju pitched in to provide some details on the place and explained why we were delayed in reaching there. Thus far, the day had been unraveling itself with some exceptionally satisfying experiences. The trek to Basmangi fort in the morning was exhilarating. We had tried some off-track routes, sat on the summit discussing random topics, met four Americans who have lived in India for quite some time and were traveling on their own, following a bucket list of treks. But what really made this journey unique was my candid conversations with the villagers of Basmangi. They explained to me the issues they face due to reduced rainfall and lack of water resources. Despite they owning a few acres of land, they worked as labourers for rich landlords when they could not cultivate. After that, we drove to the small town of Agali where we decided to stop for lunch. While looking for some vegetarian food, we chanced upon this small restaurant run by a man who treated us more like his guests rather than customers. All this had set my optimism at its peak. What could possibly have gone wrong on such a wonderful day? At Ratnagiri, we stood in front of this giant rock formation topped by an impressive fort that remains mostly intact. We had some trouble finding our way to the main entrance. We saw a guy sitting on top of the walls of the gateway. He was around the age of 20. We requested him for directions and followed his response to reach the fort. To avoid confusions in my narration, let us call him Raju. Raju requested for some water and we provided him that. He told us that his friends had gone up and since he had wounded his foot, he had chosen to stay back. While we continued to walk, he followed us. I asked him to take rest and not trouble his foot any further but he chose to walk with us. I told Manju that perhaps he was scared to trek alone and would prefer a company until he met his friends. Looking at my DSLR camera, he asked me if I was a journalist to which I replied that I was not. If only I had presumed blogging to be journalism, it would have perhaps been easier. He also wanted to know why I captured videos and I told him that I uploaded them on YouTube to share my experiences with others. He told me that he was trying to avoid being in the frame as he did not want to be captured. That was a bit surprising to me, as generally, people from small towns and villages are quiet eager to be in front of the camera. However, I did not find anything suspicious behind that statement. Along our way, towards the second level of the fort, he played some songs by Kannada rapper Chandan Shetty and we continued to march ahead. It was around that time that six of his friends came running down the trail. None of them smiled or tried to strike a conversation with us. 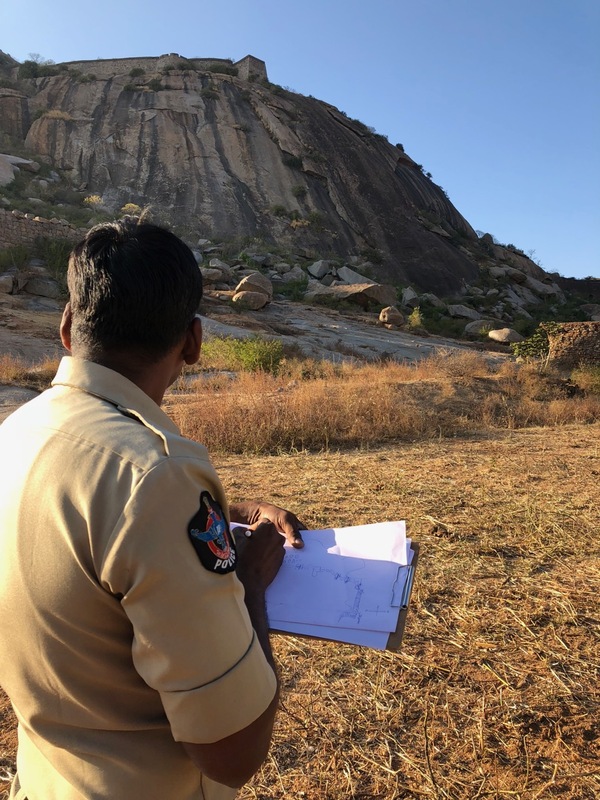 While we tried to figure out some off track route, Raju asked us if we would like to accompany him to the far end of the fort where he told us that there were better views. Surprised, I refused and continued to explore our way up the second level. That was the first time that I sensed something wrong in his behaviour. I looked at my friend Manju and he agreed. I asked Raju whether all his friends had returned. He told me that not all were his friends and they had made new friends along the way. The others were not in sight. His answer made me a bit suspicious about the behaviour but my overwhelmingly positive experiences during almost every solo backpacking trip I have been on has made me feel positive towards life. During my travels, I mostly met good people who helped me along the way and that had filled me with immense faith in humanity as compared to a previous sceptical opinion that I had about human nature. However, my instincts made me pull out the trekking pole from my bag as a sign of protection in case of any unexpected situation. I did not think that this was something planned but more of an afterthought in them, after having seen us. While narrating my story to my friends some suggested that one must immediately return when there is slight suspicion. And it is true, but as we say, easier said than done. Nobody but us can really understand what the situation was at that time. Reflecting upon it now, at that stage, we were already trapped. That was probably their first attempt to attack us. The location we were at, was a passage between two gateways to the second level and had a flight of stairs that led from one entrance to the other. We were surrounded by walls in all directions. Moreover, the bushes obstructed the view of the trail behind. The moment we would have returned to follow Raju, his friends, who were perhaps hiding behind the bushes would have charged at us right there. At the next level, we met three village boys. I asked them if there was anybody else on the summit to which they replied that there was nobody up there. By now Raju and another friend of his, who wore a black shirt, followed us. We relaxed there for a while. We were surrounded by the fort walls and in front of us stood a giant rock supporting the last level of the fort. Raju told me how some kids, challenged by their friends tried to descend the huge rock and had fallen to death. My instincts kept on hinting me that there was something wrong and I am not sure why I kept ignoring it. I took a picture of them and planned to WhatsApp it to a friend for reference. After clicking, something distracted me and I forgot about the plan. By now, Manju was feeling much more suspicious about them than me. He told me later that he contained his thoughts considering my sanguine outlook. I feel completely wrong now about the statement I made at that moment that we must not ruin our moment by thinking about them. At that instance, being oblivious was not a wise decision. We could have headed back with the village boys. Not sure if that would have avoided the situation but it sure would have been helpful. But clearly, that day, my senses did not work very well. It is funny because I am always extremely cautious about my surroundings when I travel alone in a strange country but I think I had a lot of confidence that nothing could go wrong in my own country, amongst my own people. We climbed to the last level of the fort while Raju and his friends stayed back in the previous level. We briefly discussed about them and Parth thought that they were probably here doing something illegal and our presence was interrupting it. Though the explanation was not very convincing, it sure did help us reinforce our trust in carpe diem and enjoy the beautiful views that the summit bestowed. The rays of yellow evening sun virtually painted an enriching glow on our faces. We recorded a few videos in which we spoke about our experiences in our mother tongue. A lot of time was spent there that made Raju and his friend curious. They came up to spot us but headed towards the other end of the fort; away from us. After a while, we decided to descend. We are soon followed by them. They asked for more water. I am told later that perhaps it was their strategy to finish our water or gauge how much of water was left. By now, I was definite that something was about to happen but I was not sure what it was going to be. To be very honest, I was more curious than scared. Perhaps, subconsciously, I wanted to take this risk and come face to face with the reality. I was the first to exit the entrance at second level. As I stepped out, on my right, I saw four guys hiding against the wall. They stared at me expecting a reaction. I ignored them and continued to walk. Seeing that, they were totally confused and waited for some action to set the trigger. As I walked a few steps further, I heard my friend Manju scream. I turned back to see that Raju and his friend had attacked my friends from behind by pushing them down the stairs. Just then, the others attacked us with sticks. Two ran down the steps, towards me. The other four surrounded my friends. I have heard people say that in situations like this it is the instinct that acts and you are unaware of what is happening. I experienced that for the first time in my life. I was told later by Parth that I was swinging my trekking pole and hitting one of the two guys attacking me. But that moment lasted for just a few seconds as one of the guys pulled out a dagger. I stopped immediately and scanned the situation. Manju was in complete panic. He had a cut on the back of his head and he was bleeding. The white coloured kurta that he wore was soaked in blood, around the shoulder. He was continuously pleading them to stop the attack. Parth did not seem to react. Our eyes met and he calmed down and moved to a side. He told me later that when he had seen me calm down, he came to terms that this was really happening. Somebody tried to hit him and Manju immediately stopped them by telling that he was from a different state and requested them not to trouble him. I think, those few seconds that I took to gauge the situation allowed me to settle down and decide the next steps. Acting per your instinct is unavoidable but not always favourable. On the contrary, settling down quickly and taking a moment to calm down before reacting is more important. My instant reaction was to return my look back to the guy holding the dagger and trying to calm him down. I told him that he did not have to do this and they could just take whatever they wanted and we would not resist. I brought his attention to my friend and said in Kannada - "Hing Yaradru Hodithara? Raktha Barongey?" (I don’t think it could be properly translated to English but it questions their mannerism and behaviour that has caused grave injuries). I remember thinking to myself that nothing is worth a life. My question about his mindset seemed to bring a change in the guy holding the dagger (Let us call him the "dagger guy"). He stole eyes from me and nervously replied something that made no sense. I guess he too was a bit shocked by what this had transpired into. Just then, two people charged at me with a stick. One guy hit me in the head and I looked at him and angrily asked him to stop doing that. The dagger guy stopped them from continuing. Someone snatched my trekking pole. I observed my right hand wrist that had swellings. I really do not know when that had happened. There was one guy in the group who acted like a maniac. He would lift a granite stone and threaten Manju by telling him that he would drop it on his head. The others acted like they were calming him down. That is another strategy they use to deploy an aggressive team member to frighten the victims and demoralise them. We were asked to move back to the entrance. Parth remained silent and I stayed clam but Manju kept on pleading for mercy. Manju was clearly under shock. Seeing him fear, they tried to frighten him more and let us be. I chose not to calm him down or stop him from emoting himself. I understood then that every individual has different ways of responding to a situation based on their own life’s experiences and one should be allowed to express it. I think it was then that I began observing the guys in great detail and curiously studying their behaviours. I know I am being selfish here by confessing that as a solo traveler who constantly seeks adventure, as a story teller who looks for exciting experiences to narrate, even in that moment, there was a sense of thrill in me. I realise that by saying this I am being extremely unfair to my friends. Hence, I want to clarify that I am referring to only my experiences here. And of course, I prefer to be honest rather than being pretentious. I continued to observe the details of the situation. The guys were far more tensed than Parth or me. They asked for our belongings. I handed them my camera, my bag and my cellphone. They began searching my pocket for a wallet. I told them that I did not carry one. They suspected it and continued checking. Raju smiled and asked me why I had come without money. I tried to lighten the moment by telling them that I relied on my friends for money. I had actually left my wallet in the car and refrained from providing that extra detail. Parth had to hand over his watch, his bag, his wallet that had about Rs 1000 and his gold and silver rings. Manju surrendered his cellphone, bag and wallet that had about Rs 500 in it. They took my backpack and cut its straps. With that they tied my hands and legs. At some point, looking at me observe everything with amusement, Raju could not help smiling and commenting about my calmness and curiosity. The guy tying my hands had a tough time making a tight knot. Parth told me later that one of them was too nervous and kept staring at everything without acting. They asked me to remove my shoes and they undid its lace and tied the legs and hands of my friends. Raju came to me with my cellphone and asked me for the code. I lied to him that it did not require a passcode and only needed a click on the home button to unlock. When I did that my thumb print unlocked the iphone reinforcing my theory. He bought it. The offenders offered water to Manju. I watched Manju requesting for his inhaler as he suffers from asthma. They handed it to him. Next, almost immediately, one of them, covered my face with Manju's bag. Without visibility, listening to my friend scream for mercy made me feel extremely uncomfortable. When you remain blind folded without being able to witness the act that is creating a cry, you panic. I also felt suffocated, so I turned the bag towards the slit so that I could look through it and slowly with my hand lifted the bag. Right then someone sprayed pepper spray into my left eye. That came totally unexpected and until my friends explained later, I had no idea what was sprayed. My eye burnt very badly and I began to rub it gently. My friend told me later that the attackers tried to spray the solution on their eyes too but the bottle was empty. But they were determined to use even the last drop of it. They rubbed their fingers around the nozzle and applied the collected solution on to the eyes of my friends. They warned us not to follow them and we assured them that we had no such intention and they ran. While I still struggled with the aching eye, Parth took the bag off my head. Within a few seconds, three of them, led by the dagger guy returned panicking about the debit card found in the wallet. Manju claimed it and they gave it back. They also asked us about the bike key that was found in the bag. Parth told them that it was his and the bike was in Bangalore. They threw the key in a direction away from us. I saw them hold my car keys and home key in their hand. I asked them to return my house key first. Manju requested that they return the car keys as well. I echoed his request and the dagger guy told me that he would leave the keys next to the car. I asked him not to do that as it would be more of a trouble if somebody from the village took it. Instead, I suggested him to throw it somewhere around us. He obliged and while doing so, he told me that he in any case did not intend to take the car as they do not know how to drive. It is really interesting to retrospect that these events that followed after we had calmed them down seem hilarious now but at that moment none of us smiled. We had other pressing issues to worry and the humour took a backstage in the processor of our minds. I was still struggling with my eye when I saw Raju place my water bottle next to my feet before leaving. I asked Parth to hand over the bottle to me and with the remaining water I washed my eye. We picked the keys and began our descend. When it was all over, I laughed loudly. Both Parth and Manju looked at me in surprise. I told them that they would consider my behaviour funny but I did find this quiet adventurous. I think, I was not just being honest but also trying to lighten up the atmosphere a bit. Such an act can make you feel morally very low and for some reason, I knew that I could not prevent it from happening to my friends. I could only minimise the effect. So I asked them a question - In the end, who ran from the scene? My friends gave me the obvious answer and I told them that thus, we were not the one who need to feel bad or ashamed. They had wronged us and they are the ones who carry back guilt and fear. I am not sure if that helped them but that thought allowed me to maintain my mental balance. When we traced the path back, I realised that the distance was too much for us to have run, in case we had chosen to. As we approached the village, we saw an old man and narrated our story to him. Slowly, people gathered and they informed us that they had seen six people run down and ride away in haste. What was really strange is that the villagers did not seem shocked or surprised. They were quiet neutral in their response. They kept telling us that the miscreants were not from their village and perhaps they were from Madhugiri or any other town in Karnataka. They also informed us that a month ago, another similar incident had occurred. A man from Bangalore was mugged at the fort and when he returned to the village, he had narrated a similar story to the villagers and requested for some money to fill petrol. And thus, they had concluded that he was lying and had cooked up a story to collect some money from them. Soon, a young man was directed towards me who told us that he would first guide us to the clinic where we could have Manju's injury checked. While we waited there for the doctor to dress up the wound, I told the man that we wanted to file a complaint in the police station. Even if it does not get back our belongings, it would bring some awareness in the region and actions should be taken to prevent such crimes in future. He told us that the police station was 5 kms away, in Rolla. He arranged for a friend to receive us there so that he could help us translate our story in Telugu. We drove to the police station to file a complaint. On our way back, we analysed the whole situation in great detail. I had two options. Firstly, I could have fought with the two guys who attacked me and gravely wounded them. But since they outnumbered us, I would have been eventually overpowered and to satisfy their ego, they would have beaten us up more than what they received. The other option was to run away from the spot as I had an advantage of being much ahead along the trail than the others. But that would have brought up two risks. What if there was someone else waiting at the next exit? Or would my escape have triggered a severe action of stabbing my friends? Moreover, it was a long way down the hill to reach there and bring the villagers back. Nothing we owned was worth a life. Perhaps some of these were a possibility but at that instant, I had no idea what these people are capable of and taking that risk did not seem favourable. One must also understand that though we feel that we can put a fight, we probably may not be able to do so easily because that is not natural to us based on our upbringing. So considering all the options, I felt that we handled the situation very well by trying to stay calm and trying to calm the offenders. My crisp counselling seemed to have worked with the dagger guy. However, I do not think that we were smart enough to prevent this. I brainstormed on all the things we could have done to stop this from happening. Our denial of the possibility prevented us from looking for an alternate exit. We could have found another way out of the fort. Another intelligent thing we could have done was to hide some valuables at the summit and return back to retrieve them after the incident. By doing so, we could have at least prevented the gold and silver ring from being robbed. Moreover, we could have sent the pictures of the guys to some of our friends and produced them as a record for the Police. But all that comes to our mind now. Nevertheless, this has been a great learning experience that has made us aware of certain emotions and judgements that we are capable of but are never exhibited until such an event occurs. If something like this has to happen again, we could be alert and perhaps handle it in a matured manner in case of an inevitable circumstance. I also think that it would be safe for the trekkers to have the phone number of the local police station so that the police can be informed when danger is sensed or if they feel trapped. It is funny, because though I elaborate in great detail about the incident that took place for few minutes, to me, more than the attack, what followed next became the most stressful moments of my life - That was to confront the society we live in. While I write this article, I remain emotionally drained by the journey I have been through after the incident. For some reasons, I have to refrain from narrating that part of the story. Those who are interested can contact me personally because it needs to be known but cannot be recorded; not yet. It is an episode much longer and disturbing than the above. But let me inform my readers that after all what has happened, we have filed a complaint and registered a FIR against the gang and the investigation is in progress. I had to stay focused despite all the discouragement I faced from every direction, so that the future trekkers will not have to face this experience. I strongly urge my readers to do more research on how to file a complaint and receive a FIR and what to do when the complaint is not accepted. Because, it is undoubtedly better to be knowledgeable than ignorant. Despite the knowledge, things are not as straightforward as they seem on paper. Hence, the most important thing is to stay determined, no matter what the obstacles are. Moreover, this experience has proved to me that I was wrong about our society. There is a lot more maturity required in us as a society and to be clear, that includes me as well. The basic thing we need to learn is to start relating to one another. I am now more sensitive towards my friends in Bangalore who hail from different states and have experienced some or the other form of harassment and insults by the locals; and that applies to all cities, towns or villages. I know now what it feels like to be alienated when you are fighting for your rights and how as a common man we can feel helpless at certain circumstances. I can understand the feeling of being surrounded by people who have no intention to help you in anyway. However, I also realise that the reasons to this are far more complex and we need to also understand the point of view of the other person who is putting us through this stress because that helps us to arrive at the causes and find some solutions. And sometimes, an honest and clear communication can go a long way. Because after all, no matter what role we play in the society, we are all humans and perfectly capable of understanding each others pain but perhaps we have still not mastered the art of clearly understanding our own feelings, let alone communicating them to others. Many I know think that I take too many risks by traveling alone and perhaps feel that such an incident was bound to happen. Some even turned this story almost immediately into a joke that they could retell with lot of amusement. Others laughed at that funny version and thus encouraged that behaviour; being ignorant to the fact that they too are contributing to an act of insensitivity towards which, unfortunately even the IPC remains ignorant. This makes me think whether I too have taken something so lightly and unknowingly hurt someone else’s feelings. Hence, I wonder if we as society are so cynical in nature? Perhaps the first step we can do is tell them that they are being ungracious and make them aware of their behaviour if they are unaware of it. But what many need to understand is that these incidents do not make people weaker but instead, make them tougher and confident. Parth put it rightly when he repeated a citation - A man does not become wiser with age, but with experiences. In a way, I am glad that this happened to me as it has made me mentally resilient. I have realised the power of convincing and influencing others during the time of crisis. However, It has also made me worry about the future of the youngsters like Raju and dagger guy who hail from small towns or villages. This occurrence has only strengthened my desire to counsel adolescents and now focus beyond cities. Though getting them arrested is necessary, I am not sure if that would really bring a change. What I feel would make a difference is to try and avoid this thought from originating in them. Moreover, the events that followed after the attack has completely changed the way I look at life and at myself. Despite what has happened and all that continues, I still remain positive, because, I know now that it is this attitude in me that keeps me going, keeps me determined to achieve what I desire. However, I have learnt that my sanguineness should not motivate me to ignore my instincts but it must be in recognising the power of human interaction that motivated Raju to leave the bottle of water next to my feet. There is hope, there are good intentions and of course there is always time to act! UPDATE:- All 6 offenders are arrested and identified. A case would be soon filed against them. For any further information, please contact me personally. This is shocking. I had heard about muggings around such places but I thought that traveling in group would prevent such things. Normally, I will try to get a local person with me but that is not always possible. Good to see that you reacted with calm and positive attitude. That certainly eased the situation. All, I emphasis on the following for all trekkers - Have the phone number of the local police station so that the police can be informed when danger is sensed or if one feels trapped. I am very sorry this happened to you and your friends. Hope all 3 of you are recovered by now - physically and emotionally. If you are adventurous, my suggestion is, visit the same place again soon and this time take a loaded gun with you. Thank You SG. We already visited the fort again and without a gun! BTW, Guns used for protection can only create more problems. We have classic examples of that from around the world. This is indeed shocking, especially since you were traveling as a group. It's important to take such incidents in our stride and leave them behind. These only strengthen us and empower us to be more cautious from the next time. Glad that nothing serious happened to any of you. I feel you handled the situation quite well, especially considering the amount of emotions and stress you were suddenly exposed to. Hello Wido, Thanks for writing. Good news is that 4 of the 6 gang members are caught and about 90% of stolen items are retrieved. Do share the news will fellow travelers/trekkers. I'm one of the Americans you met that day. I'm so sorry about what happened. I will let others know. Thanks for writing. Sure, Please share with co-trekkers/travelers. UPDATE - 4 of 6 Gang members are caught. 90% of the stolen items are retrieved.